The United States of America today honored ten courageous women from around the world on International Women’s Day. The women received the 2012 International Women of Courage Awards for their outstanding global efforts to uplift women’s role in development. The awarding ceremony was attended by Secretary of State Hillary Rodham Clinton, Ambassador-at-Large for Global Women’s Issues Melanne Verveer, and First Lady Michelle Obama. On her remarks at the International Women of Courage Ceremony, US Secretary of State Hillary Rodham Clinton said empowering women isn’t just the right thing to do; it is also the smart thing to do. 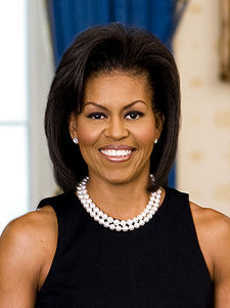 First Lady of the United States Michelle LaVaughn Robinson Obama. Investing in women’s employment, health, and education levels leads to greater economic growth across a broad spectrum. It also leads to healthier children and a better educated population overall, she added. She stresses that political systems that are open to full participation by women produce more effective institutions and more representative governments. She underlines that as long as women are on the front lines of this struggle, the United States will be with them. The United States will use every tool at their disposal to help the brave women in the 21st century. In its fourth year, Ms. Clinton said she is so honored to be joined by the First Lady of the United States, Michelle Obama. At the ceremony, Ms. Clinton thanked the First Lady for being an inspiration for women and girls and families and communities here in the United States and around the world. She stresses that empowering women is not just a priority at the State Department or at USAID, but across the Obama Administration. The First Lady and President Obama have made it absolutely clear that women and girls will be a focus of what they do at home and around the world. Jineth Bedoya Lima, a Colombian investigative reporter who was kidnapped and assaulted for uncovering an arms-smuggling syndicate. She pursues her work with commitment despite death threats. Zin Mar Aung, a Burmese political activist who refused to give up her fight for freedom and rights for the Burmese people. Shad Begum, who founded a women’s NGO in Pakistan. She ran for local political office and won. Ms. Begum has persevered even though she has been kept out of men-dominated council chambers. Samar Badawi, the first Saudi woman to sue the government of Saudi Arabia for the right to choose her own husband. Maryam Durani, a Provincial Council member in Kandahar, Afghanistan bravely sticks with her post despite recurring death threats. At the ceremony, Ms. Clinton also announced that by next week when all of the United States ambassadors from around the world gather in Washington, she will be issuing the first ever Secretarial policy directive on gender. The guidance which complements the recently released USAID gender policy, will instruct US embassies and bureaus to implement specific steps to promote gender equality and advance the status of women and girls in all of US work. The Secretary of State has honored 46 women from 34 countries since the State Department created the award in 2007. The annual Award for International Women of Courage recognizes women around the globe who have shown exceptional courage and leadership in advocating for human rights and women’s equality. This is the only Department of State award that pays tribute to outstanding women leaders worldwide.